Posted on July 10, 2013	by Judah Gutwein, L.N.H.A. 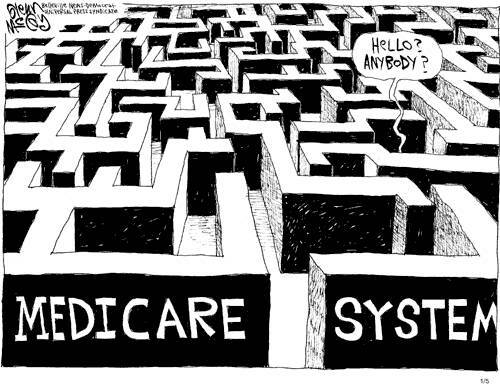 Tackling the Medicare maze is often a daunting and overwhelming task. Families have a tough enough time dealing with the hospitalization and subsequent discharge of a loved one to a skilled nursing facility for rehabilitation. To have to concurrently figure out the convoluted Medicare system of reimbursement in order to determine eligibility (and potentially how much money the family will owe privately for copays), is an extra hurdle to overcome during an already difficult time. It always bothers me when I meet with frustrated families who have loved ones in other nursing and rehab facilities and weren’t properly educated on the nuances of their loved one’s Medicare entitlements. They are subsequently left in the dark and have no idea and no understanding of what they are facing, who is paying and what is being paid for? In educating these families, I don’t wind up doing the job of the social workers and admissions people in the other facility, I actually do OUR job, because we are all about empowering the consumer. Ultimately, these families end up switching to our Regency Nursing and Rehab facilities, because they appreciate our direct and compassionate approach. We don’t play games with obfuscation, redirection and ‘hide and go seek’ tactics. There are ONLY two reasons for a Nursing home NOT to properly explain Medicare benefits to families. It’s either because they are incompetent, or because they are more interested in them$elves than in the consumer. I was just sent a Medicare article yesterday by our President and CEO with a request to read up and empower our families! If this is not a clear demonstration of top down accountability, nothing is. Mr. Gross would like EVERY Regency Nursing Center to educate our families on Medicare and to also provide the periodic updates when necessary. We have nothing to hide and everything to offer. The compassion and accountability is mind boggling and it makes me extremely proud of our organization. In fact, The Regency Alliance on Senior Care published a fantastic and easily understandable pamphlet on Medicare and how it works. We offer this pamphlet absolutely free, with presentation stands and it is prominently displayed in Government offices, Hospitals, Synagogues, Churches, Senior Centers and Doctor Offices all across the Sate. Click here to view our free material and order yours today, ABSOLUTELY FREE! Medicare comes in five basic parts, and participants select those that best fit their needs. You pay monthly premiums, either directly or through a deduction in Social Security benefits, for all but Part A. Part B: Helps cover doctor visits and outpatient care and comes with a monthly premium. Part C: Known as Medicare Advantage, it combines Part A and Part B, plus extra benefits, and in most cases, prescription drugs. Part D: Prescription drug coverage with deductibles; purchased from private companies. Medigap: Officially, Medicare supplemental insurance, sold by private insurance companies to cover most expenses not covered under Part A and Part B. Prescription drugs are not included in this coverage. This entry was posted in HealthCare News, Senior Care and tagged determining medicare eligibility, how medicare pays, how medicare works, how to understand medicare, medicare pays for nursing homes, seniors on medicare, understanding medicare, what does medicare cover, what is covered under medicare?, who is eligible for medicare. Bookmark the permalink.